When first discovered and listed as a species it was placed in the genus Pinus (Lambert, 1803), and later with Abies, (Poir 1817) the firs, and later with its own genus (Dammara). It was first recognized as being part of Agathis in 1807 when it was listed as Agathis loranthifolia, and beyond that with species names Beccarii, Celebica and Macrostachys, although it acquired many more names before botanists and taxonomists settled on Dammara. Description. Celebes kauri is an evergreen coniferous timber tree native to the Moluccas, Celebes and the Philippines. 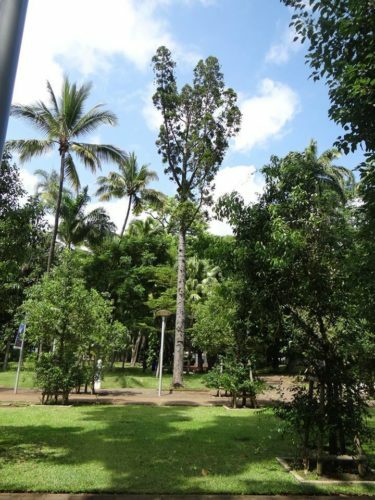 It is a medium-large conifer up to 180 feet (60 m) in height found in tropical rainforests, it can grow at sea level on up to very high mountainous regions where it becomes extremely stunted. It belongs to the southern hemisphere family Araucariaceae, widespread throughout the entire Mesozoic, emerging about 200 million years ago. An extinct genus, Protodammara (which appeared long ago, during the Mesozoic), derives its name from this tree. This tree is a source of dammar gum, also known as cat-eye resin. Mature trees follow the usual Agathis model of a long clear bole with a broad emergent crown of large rigid first-order branches. 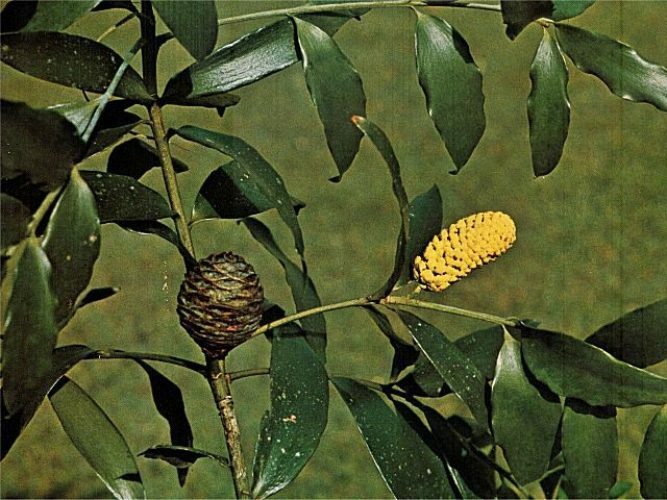 The authorities differ in opinion about the bark, calling it gray, red-gray, light brown, or black, finely dimpled to thinly scaly or with many resin blisters, or rough, exfoliating thus with few epiphytes. Leaves are sub-opposite, thick, coriaceous, light to dark green in color, and highly variable even on a single tree. On young trees the leaves are lanceolate, acuminate, 1.2 by 2.8 inches (3 x 7 cm) to 1.4 by 5.2 cm (3.5 x 13 cm). On adult trees the leaves are long-oval with a rounded apex, 1.6 to 3.2 inches (4 - 8 cm) by 0.6 to 1.2 inches (1.5 - 3 cm), with a 0.04 to 0.3 inch (1 - 8 mm) petiole. Pollen cones are axillary and solitary on a stout ca. 0.14 inch (3 - 4 mm) peduncle, with a firm, smooth surface; 0.5 to 1.2 inches (12 - 20 mm) long by ca. 0.28 inch (6 - 8 mm) in diameter. Female cones are globular or ovoid, 2.2 to 4.8 inches (5.5 - 12 cm) long by 2 to 3 inches (5 - 7.8 cm) wide with nearly triangular cone scales and broadly rounded, thin, upper corners. Seed are subovoid, to 0.6 inch (1.5 cm) long with one wing to 0.5 inch (1.3 cm) long with another that is much shorter. Distribution. This species is native to the Philippines; Indonesia — the islands of Sumatra, Java, Borneo, Celebes, Moluccas. E.J.H. 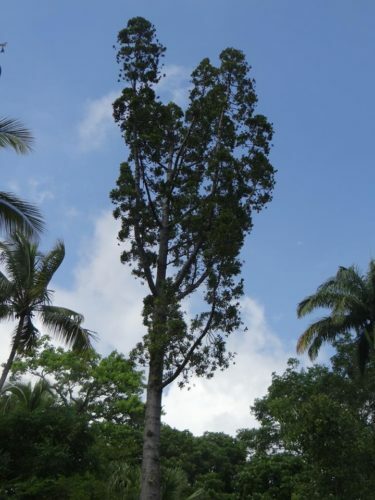 Corner in his 1988 study, Wayside trees of Malaya also places this species in Vietnam and New Guinea, but no one else mentions this; he may be lumping it with other species of Agathis. The elevation range appears to be from 650 to 8,000 feet (200 - 2500 m) above sea level, occurring on podsolized sands and limestones, from which it is inferred that it can accept a wide range of silicate and carbonate substrates, though perhaps not ultramafics. Agathis dammara growing in habitat on the Isle de la Reunion. Agathis dammara — the same tree from a distance. 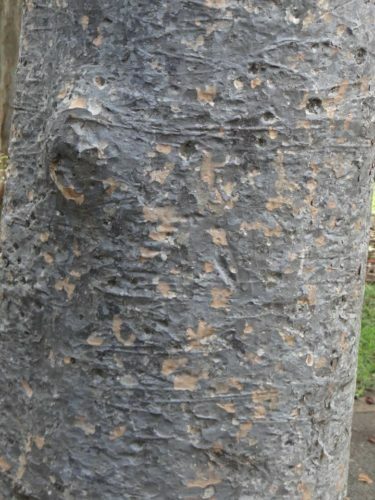 Agathis dammara — a closeup of bark detail. Agathis dammara — a closeup of foliage and cones.